The third of three posts in which the 2xtandem crew reflect on the past 18 months. a waterproof black bag with air mattresses, bedding and the tent poles. with us whenever we get off the bike. Q: What about the tandem – was it the right decision? Mike: “Yes, it was but I don’t think they suit everyone. There’s no escaping your partner on a tandem. 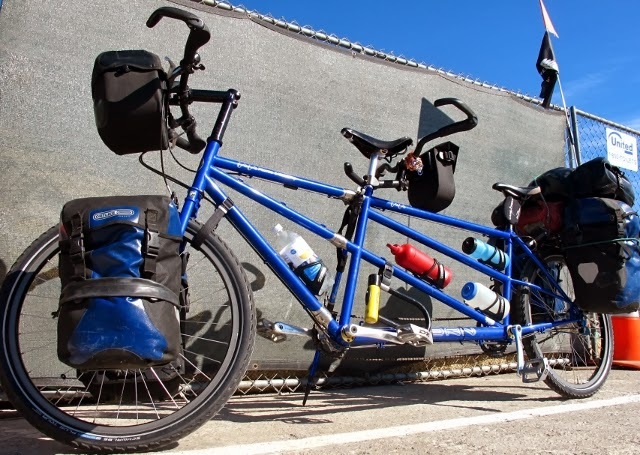 “There are some drawbacks with a tandem – just because it carries two people doesn’t mean you have twice as much luggage space. You really only have four panniers, the back rack and two handlebar bags. It’s been a constant struggle to minimise our gear and I still feel we have too much. of the tandem so she can take some of the load. Q: What have you learned from the last 18 months? Q: Anything you will do differently next time? Q: What worked well on this trip? Judy: “The thing that worked best was something we did before we set out – renting out our house to cover some of our costs. 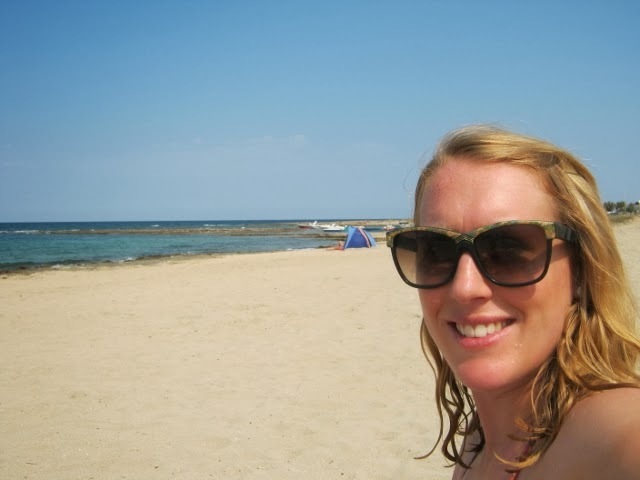 “Also, loading money onto prepay travel cards – we had no trouble anywhere accessing the money. We took two varieties of cards each and kept them in different places in case of theft. “My smartphone and Mike’s little computer and a Kindle each with lots of free books loaded up before we left. Downloading our travel guides to the Kindles as we went – it was sometimes difficult to navigate the guides on the Kindles but far better than carrying books. 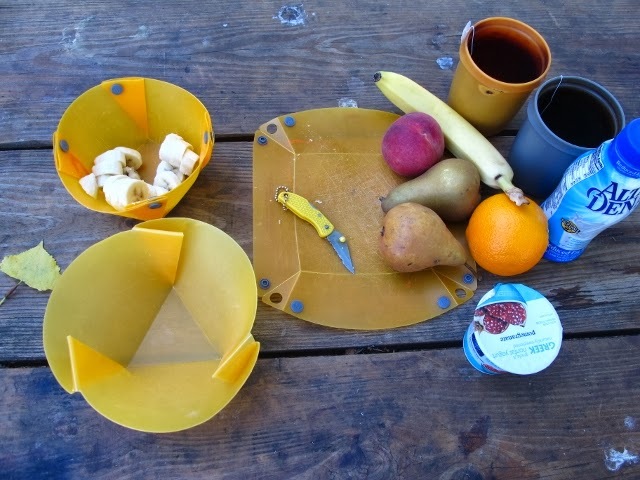 Mike: “It all seems to be about electronics, but we also had a Steripen water purifier with rechargeable batteries and that was great in Asia where we were always thirsty. Less plastic bottles to throw away as well. constant use in Europe and North America it is showing signs of wear. 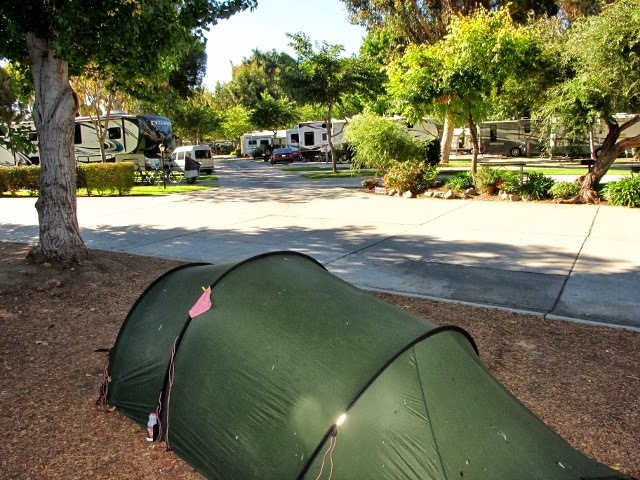 "Our Hilleberg Nallo 3 GT tent is a three person one, and we’ve been grateful for the room it gives us. Interestingly though, two zips are on the way out and after a year’s use it’s showing signs of wear and tear. Maybe we would go back to a good old Kiwi Macpac next time. 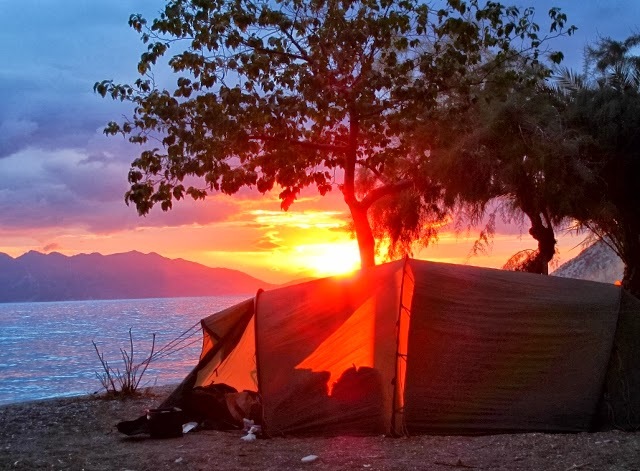 “Using guesthouses throughout South East Asia worked well and we were able to forward on our tent and stove. Q: What are you most looking forward to back home? 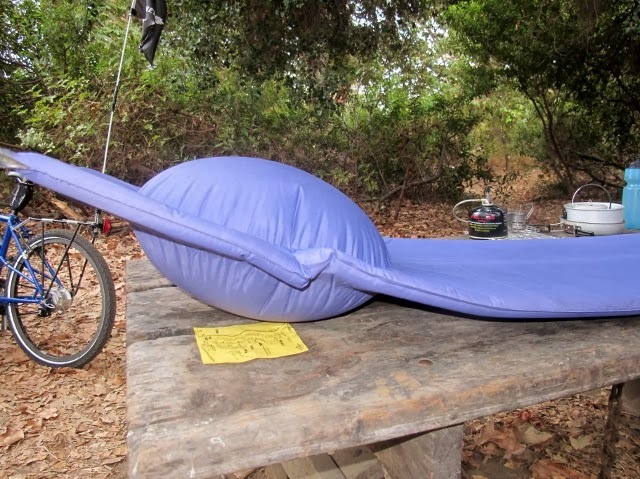 The second of three posts in which the 2xtandem crew reflect on the past 18 months. Q: What was your favourite place? 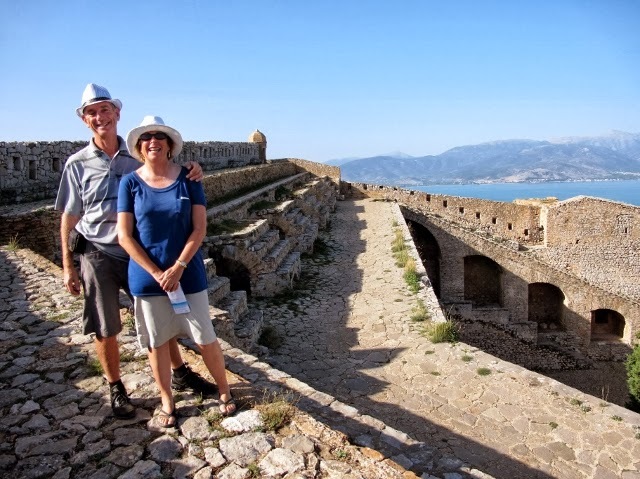 Mike and Judy, above Nafplio. 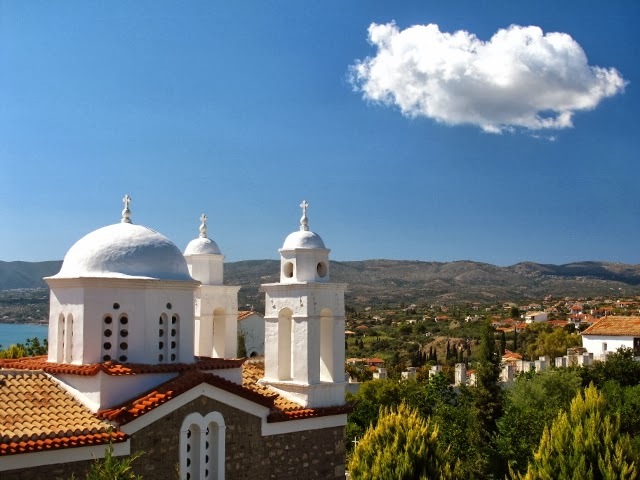 Mike: “The Peloponnese – we loved the scenery and the cycling. 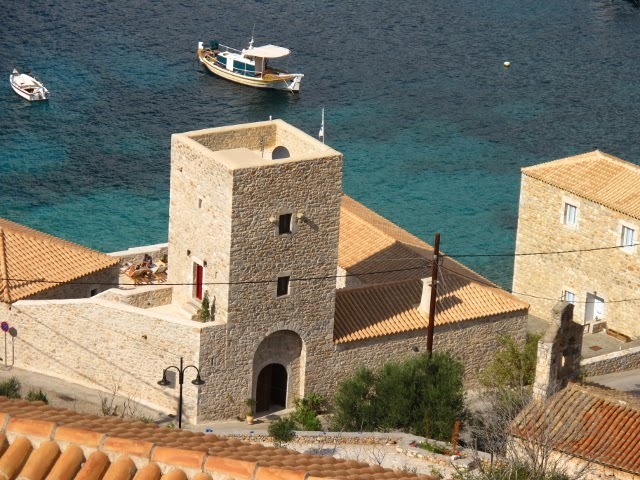 It was hilly and hot but the surroundings and the people made up for it, which says a lot about the Greeks because their economy was in turmoil and people were losing their jobs. 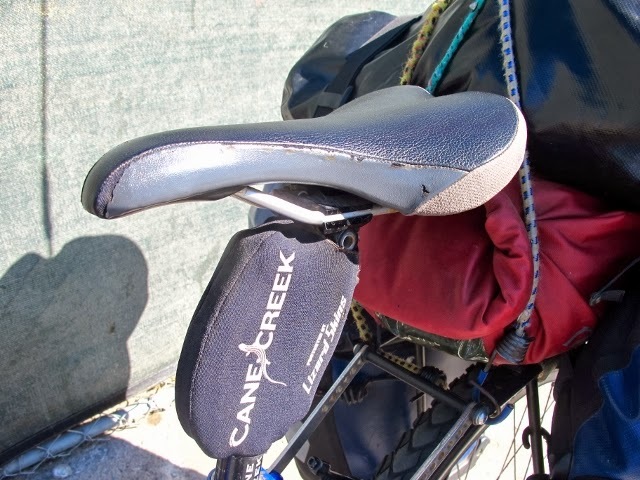 But more seriously, the least favourite aspect of the entire trip is seeing, so clearly by bicycle, the disturbing discrepancy between the "haves" and "have nots" in America; the poor and homeless people are everywhere. And don't get me started on the partisan politics, the pathetic minimum wage paid in America, the astoundingly low taxes paid by the profoundly rich corporates and how "high fructose corn syrup" isn't a banned substance in America beats me! Q: What was the most difficult challenge along the way? Q: What about personal safety – did you ever feel in danger? Q: What about your possessions, were they ok? Judy: “Yes, but we were always watchful. One of the advantages of cycling as a couple was that there was always someone to mind the gear and the bike while the other went shopping or whatever. 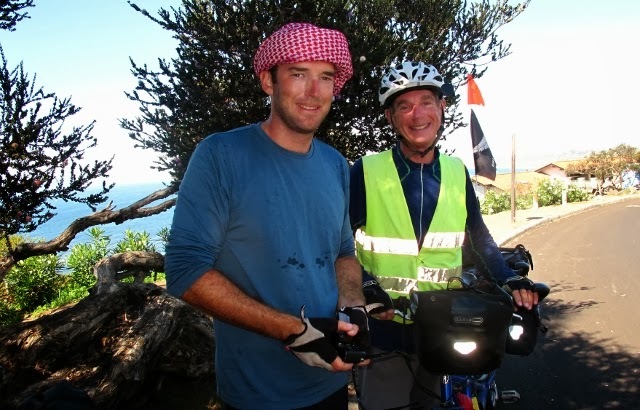 Even when we stopped for coffee or lunch, we would make sure the bike was beside us." Judy: “Absolutely. There’s too much rain in our New Zealand winter to stay home." Judy: “So many bike paths and places to cycle in Europe and it’s such a bicycle friendly environment. Maybe Sri Lanka, parts of Australia but their wildlife terrifies me. Maybe Ireland/Scotland – if they have a heat wave. I’d love to return to British Columbia, maybe New England or Nova Scotia. Maybe parts of Argentina (near Bariloche) or Chile." Tandem Touring - Was It Worth It? The first of three posts in which the 2xtandem crew answer some of the questions we are frequently asked and reflect on the past 18 months. Q: You turned your lives upside down, and gave up your careers at an age when most people are saving for their retirement. Was it the right decision? Judy: “I felt that the time was overripe to leave the work I had been doing for 32 years. I was tired in the job, not as effective as I used to be and I wasn’t growing as a person. Mike: “I felt there had to be more to life than going to work each day, and I was beginning to feel like a dinosaur fighting a rear guard action in my job. Television news has changed over the years and I was no longer as comfortable in that environment as I had been. Every bit as important though, was the need to go out and challenge myself. Could we make this tandem thing work, could we cope with life on the road and what adventures we would have along the way? It held lots of promise. Q: What were your biggest concerns before you set out? removes some of the shock. Q: What have you enjoyed most about the experience? 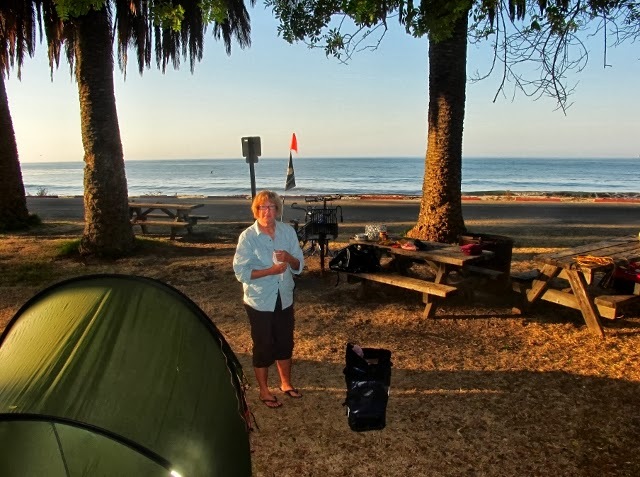 Judy: “Being out in the elements in good weather.Travelling by bicycle, staying fit on the job, the food and people of France, the patience and good humour of people in S.E. 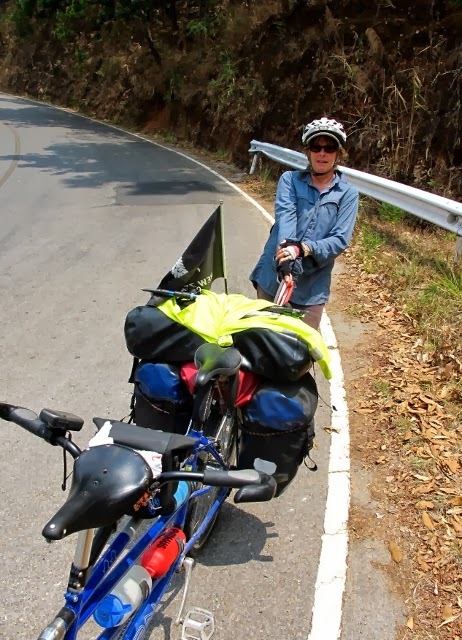 Asia, joining up with family and friends from time to time, enjoying the hospitality and making new friends along the way, the wonderful landscapes and the almost sensory overload of travelling on the bike." still travelling - currently in India. 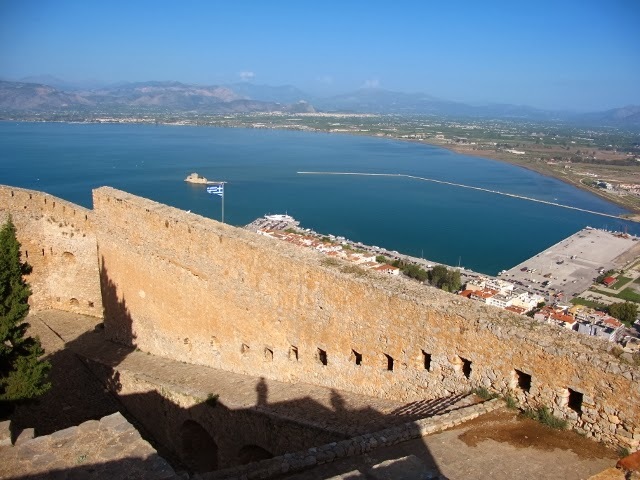 Mike: “Being joined by my daughter, Merran, on the island of Corfu, in Greece for a few days. 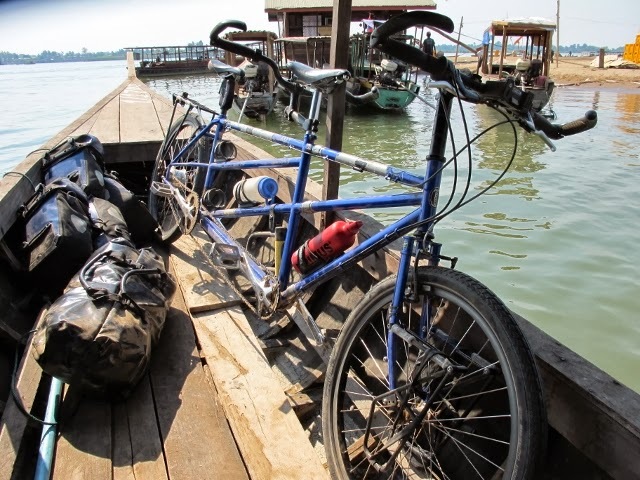 And by my son, Sam, who came cycling with us for three weeks in Cambodia. It was the first time we had spent any time with Sam in more than a decade, and it felt like welcoming him back into the fold. Det - one of the Thousand Islands group. And he and I had a great night drinking beer beside the Mekong. By the time it was over I was ready to go to sleep in the garbage and with the snakes on the river bank. Sam climbed a post and broke into our guesthouse and we must have woken up most of the place. It was a great night but not one to repeat too often. and a car hooked on the back. stage - but we still caught our share of torrential rain. Q: And what have you enjoyed least? Judy: “Being out in the elements in the bad weather. 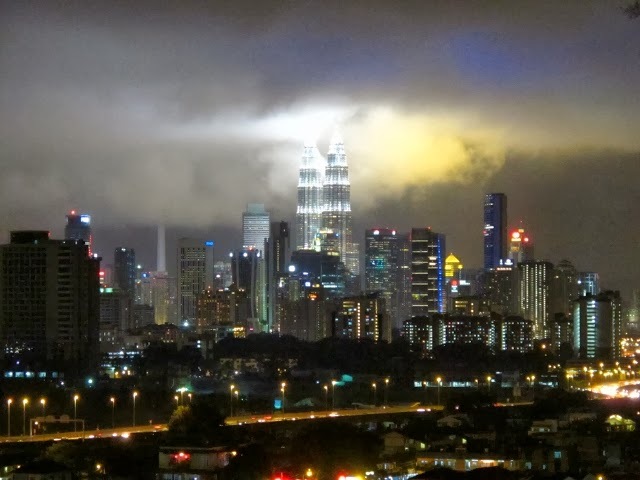 Cycling in the cold and rain in Europe and torrential rain and thunderstorms in Malaysia. “Navigational disagreements! Without large scale, paper maps (which I love) the GPS turned out to be an at-times contrary beast – taking us on some roundabout routes which infuriated me. 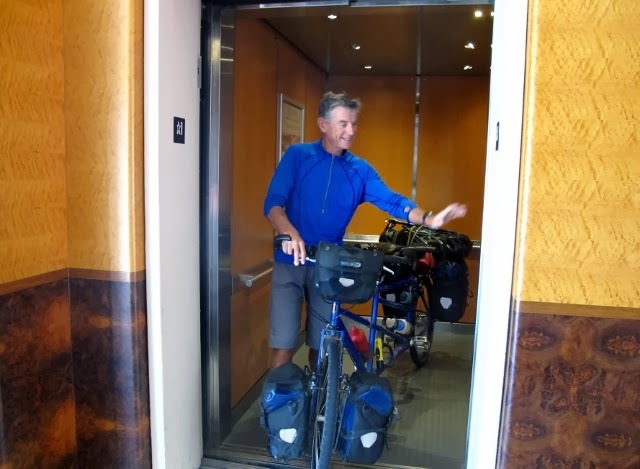 For example, the steep and long and circuitous route the GPS took us to our hotel in San Francisco when we later learned there was a flat, easy, cycle ride to the same hotel. Mike: ”Ditto Judy on the navigational disagreements. I found the heat pretty hard to take in one or two places – coming off the Bolaven Plateau in southern Laos I felt completely overwhelmed by it and took to bed for a day. Other than those, it's hard to think of anything we didn't enjoy." 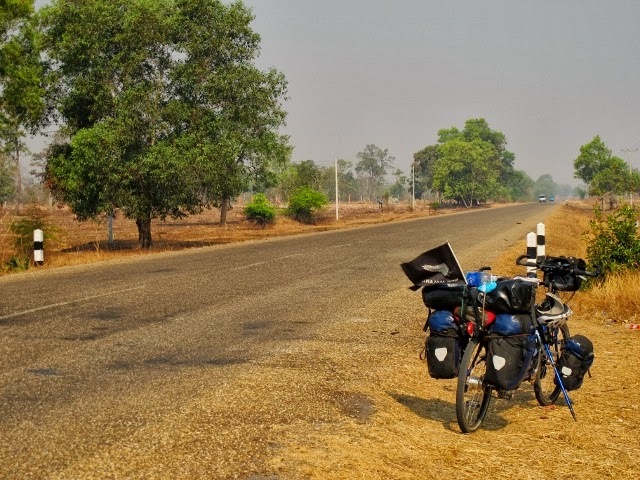 16,000 km by tandem, nearly 18 months and we have come to the end of the road – for now. 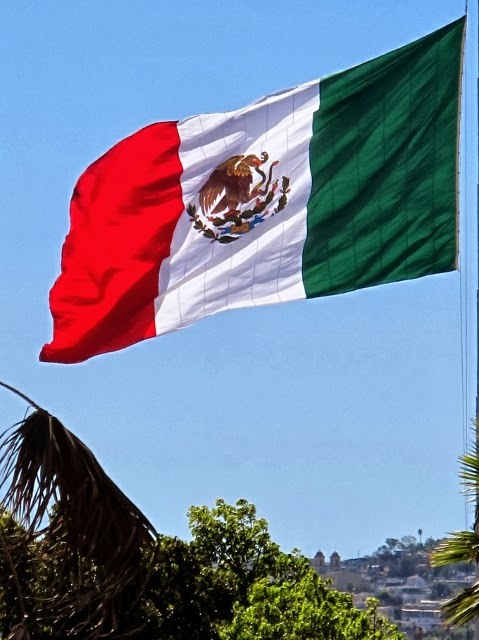 We pulled up on the U.S. side of the border with Mexico and stood the camera on its mini tripod to take a picture of ourselves and a sign saying “No Return U.S.A.” and headed off to find something to eat. It was hardly a celebratory lunch. 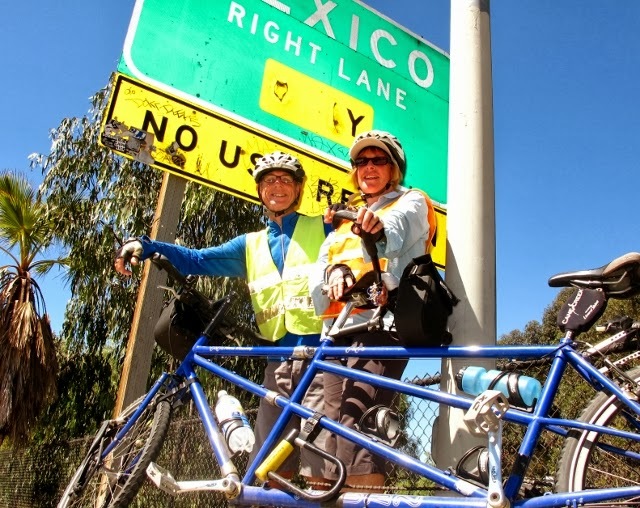 We pedalled around the small, hot and somewhat dusty border town of San Ysidro looking for anywhere that sold coffee. No joy. In desperation we settled for a KFC . 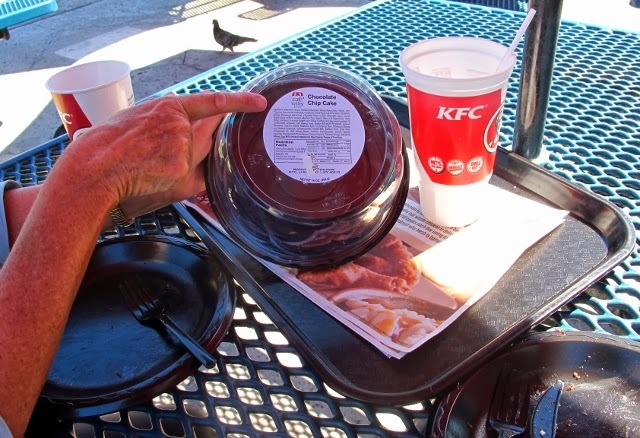 It had no coffee and neither of us could stomach the thought of the Colonel’s chicken. Judy went for mashed potato, I went for what I thought would be a slice of chocolate cake. At the border - "No U.S.A. Return"
The cake turned out to be a whole cake, 16 oz or 454 g of it, and we tucked in hungrily. Judy gave her soft drink a half-hearted ok, but my iced tea wasn’t iced. When I tried the ice dispenser, two soft drinks gushed over my hand. The restroom was locked with a sign telling customers to take their receipt to the counter to get the door opened. The queue at the counter was so long I gave up and rinsed my hands with water from one of our water bottles. The chocolate cake was sickly sweet and gooey and at the very least needed cream or ice cream to balance the flavour. We were both so hungry we ate the lot but left feeling queasy. 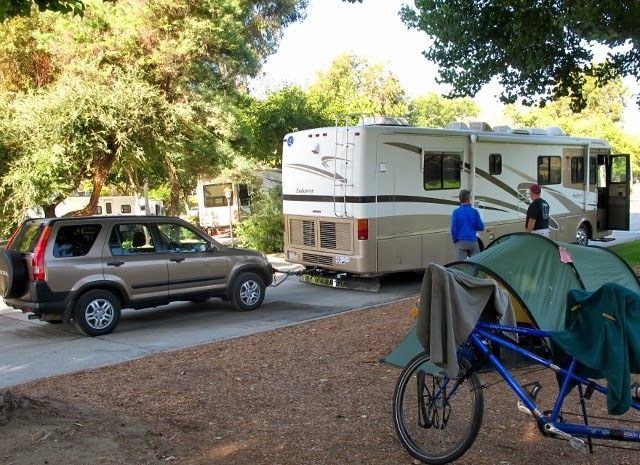 We pedalled north, back towards our campsite at Chula Vista, south of San Diego. It felt a bit strange. We have become used to cycling through borders when we encounter them, and it was an odd feeling to know this was the end of this particular trip. But the feeling soon went. We have a couple of weeks to relax before we return to New Zealand and we mean to enjoy it by putting our feet up, catching up on some reading and beginning to organise our lives for when we get back. And planning the next trip. 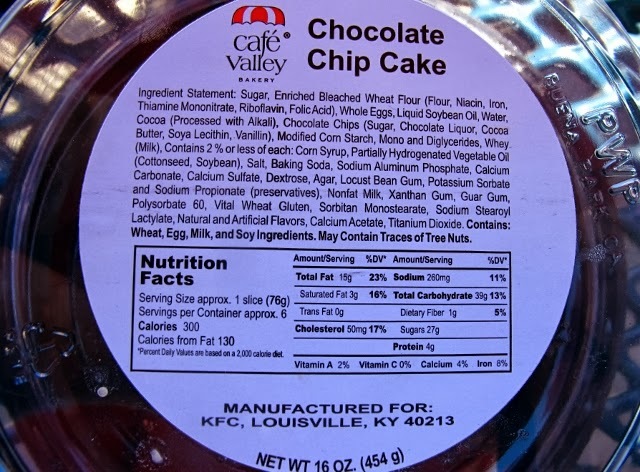 Chocolate chip cake - how many ingredients does it need anyway? One of those listed is titanium dioxide which is found in sunblock. 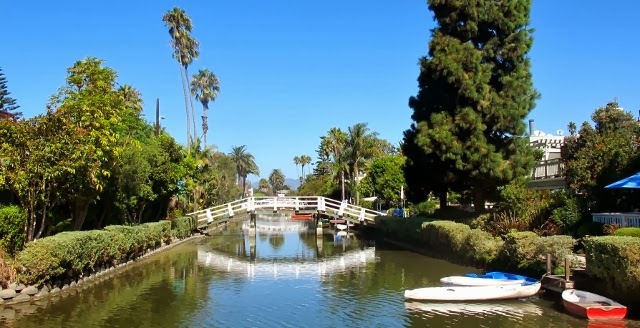 Who would have thought that cycling through L.A. could be such a blast? It may be one of the most car centric cities in the world, but it can also work for cyclists. Mike, Eric, Judy and Greg take a break from cycling. We knew it was going to be a long ride – too long to achieve in one day – so we made one of our better decisions and logged onto Warmshowers, www.warmshowers.org the internet organisation where cyclists host cyclists. Right on our path was a guy called Eric, who lived at Venice Beach. He sounded an affable sort so we dropped him an email and he replied saying ,”sure, come and stay”. 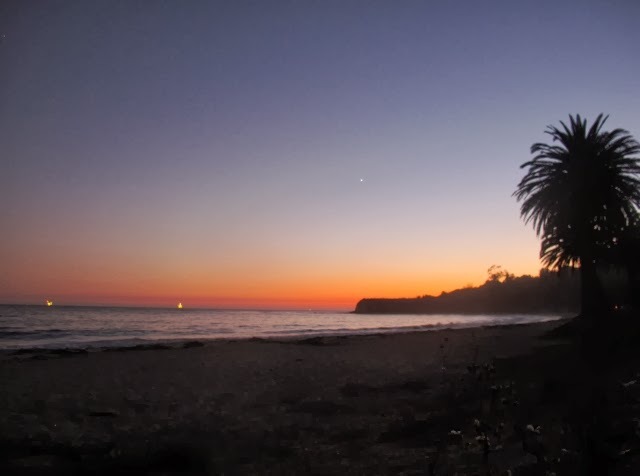 The ride south to L.A. was fine as we headed out of our campsite at Leo Carrillo State Beach, keeping an eye out for Bob Dylan who we had been told lives just south of Zuma Beach. He wasn’t offering morning coffee, so we pushed on marvelling at the huge, deserted expanse of beach that is Malibu. The traffic became busier, the shoulder disappeared for a time and we started to feel squeezed. 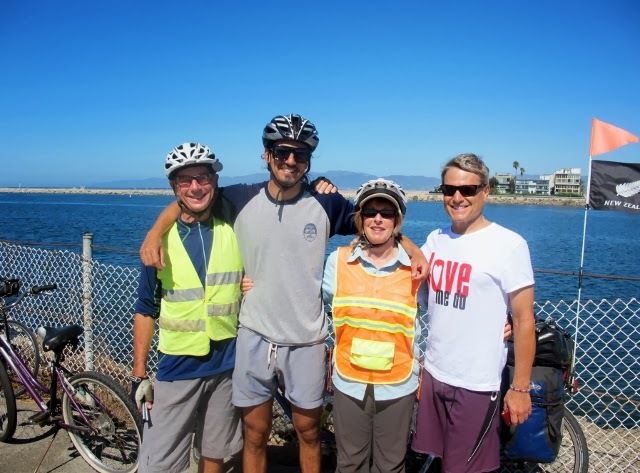 At Santa Monica, we escaped from the traffic onto a beach trail – shared by cyclists, walkers and joggers, skateboarders and a few rollerbladers who seemed to be the last of a dying breed. Greg, Eric and Mike the Captain at Venice Beach. The next morning Eric and another house guest, Greg, an actor just returned to L.A. after living in Tokyo for nine years, escorted us south for a few miles from Venice Beach. It was one of those rides that will stay with us – it was a blur of motion, sights and sounds so fascinating we wanted to linger. “Marry me or I’m out,” recounted a woman to a friend as we cycled past. “Great soundbite,” said Eric and we all laughed. He and Greg were looking at the waves – the surf was ok and they were feeling tempted. They stuck with us as far as Manhattan Beach where we stopped for coffee and to allow Greg time to practice his Japanese pickup lines on a gaggle of passing Japanese women tourists. 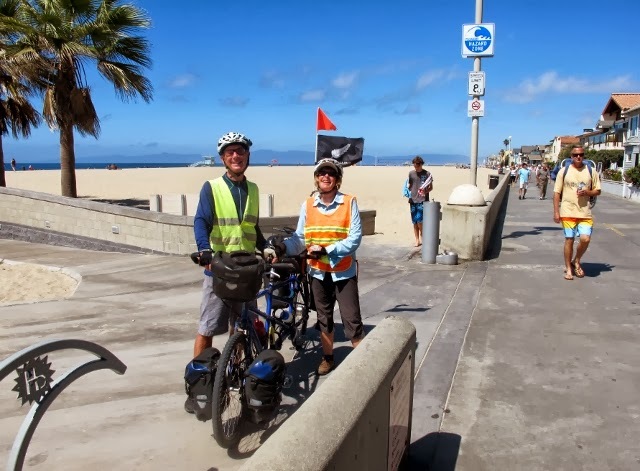 We said our farewells and the others turned back, leaving us to continue down the trail as it meandered its way through Hermosa Beach to Redondo Beach where it finally ran out. We had been encouraged to take a scenic route from there, over the Palos Verdes instead of cutting inland. It was pretty, and pretty long, as we wound our way past multi-million dollar homes, the (Donald) Trump National Golf Course and even the Trump National Highway. 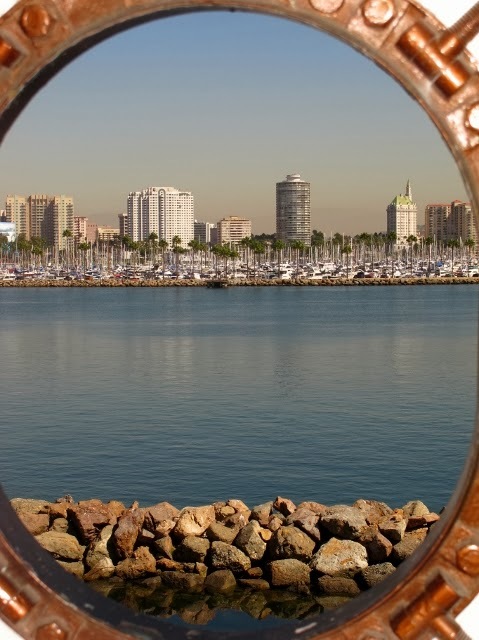 On the far side we descended into Long Beach and became caught up in back streets, industry and wharves before reaching our destination – the Queen Mary. 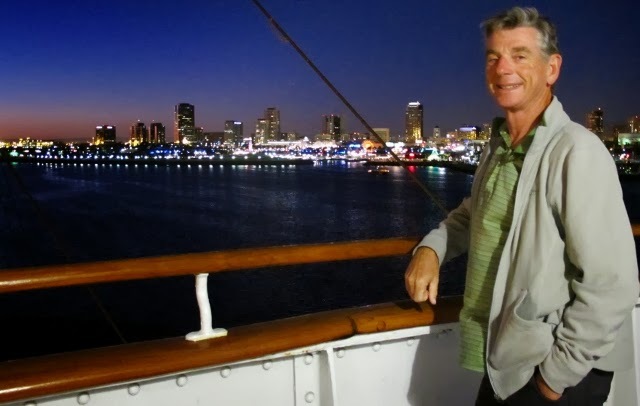 On the Queen Mary - Long Beach in the background. across theAtlantic until she was retired in 1967. 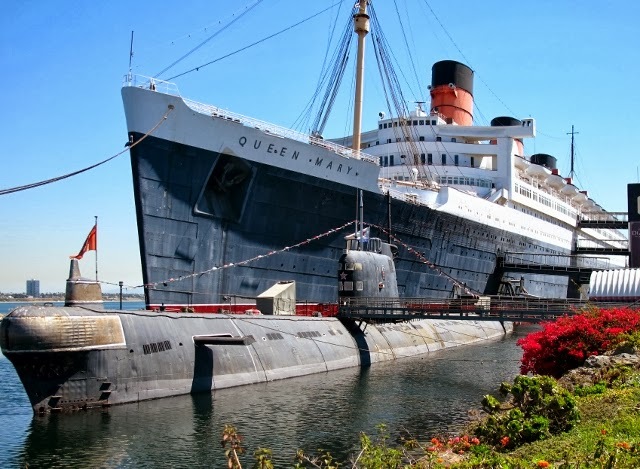 The Queen Mary dwarfs a cold war submarine. 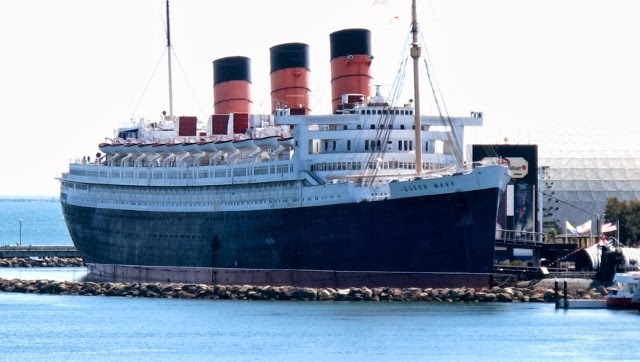 Since her retirement in 1967, the grand old ocean liner has been owned by the city of Long Beach and used as a floating hotel. 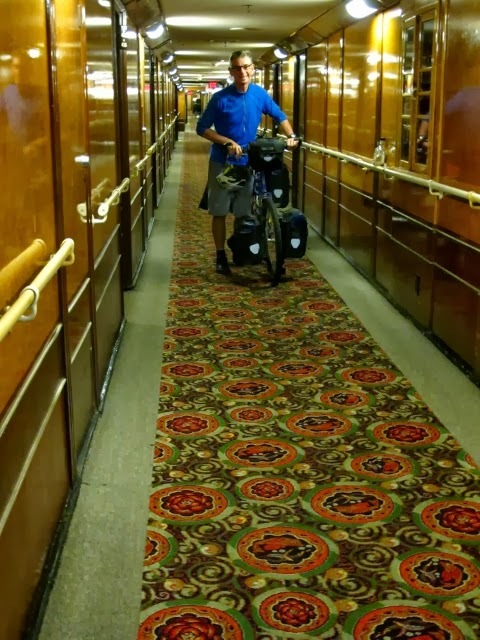 We had planned for some time to treat ourselves to at least one night on board and it was a relief to push the tandem through the crowds into reception, down the stairs and a long hall to our cabin. 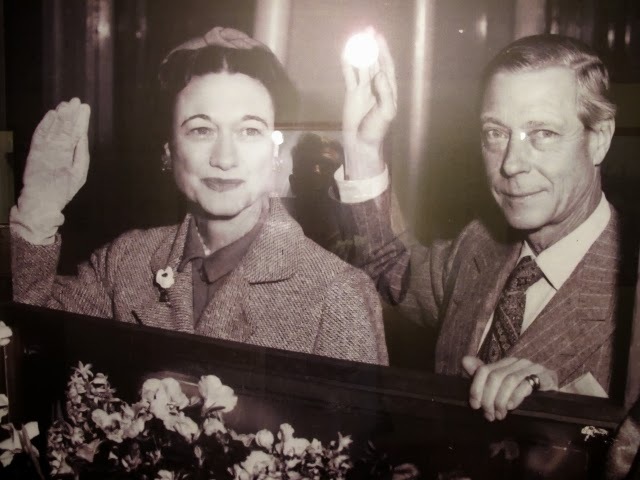 Maybe it was all the excitement – the sensations, the wind, the laughter and the conversation of the day – but we both felt as though the ship was moving and we were bouncing off the shower walls as we washed off the day’s sweat. 155 pieces of luggage with them. 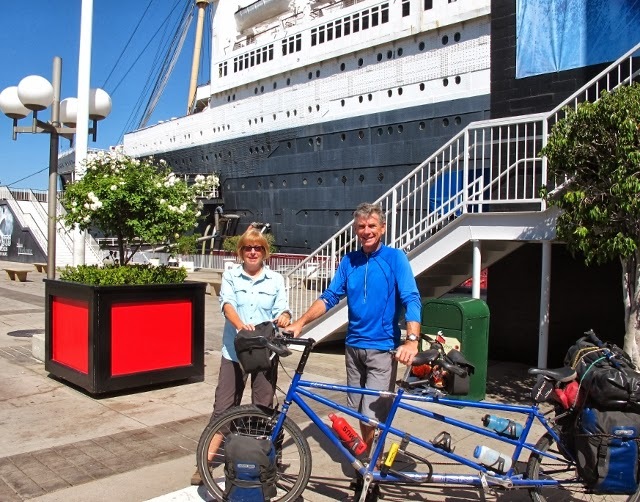 Neither our budget nor our dirty cycling clothes would have worked in the ship’s “signature restaurant” – Sir Winstons – but we were happy to tuck into giant burgers, fries, beer and wine in the Promenade Café and collapse into a bed with crisp, white sheets. It had been a special ride and we had made it safely – L.A. you were much, much better than we dared hope. It’s taken us the best part of 18 months to get around to trying something we should perhaps have looked at long ago. It’s to do with what’s called “crank phasing” on the tandem and arises from the question – which of two options is best? Should the pedals be synchronised so that for example, the two left pedals are at the top of their stroke at the same moment. Or is it better to have them "out of sync" – so that when one pedal is at the top of its stroke the other is half way down? 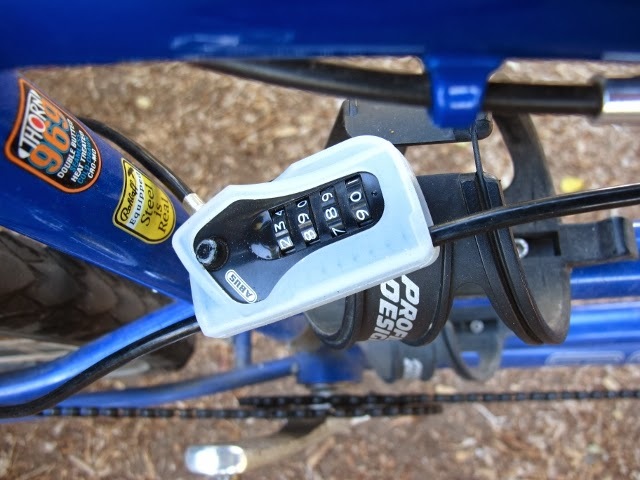 The idea to have the pedals “out of sync” has been suggested to us by a couple of cyclists we’ve met along the way. 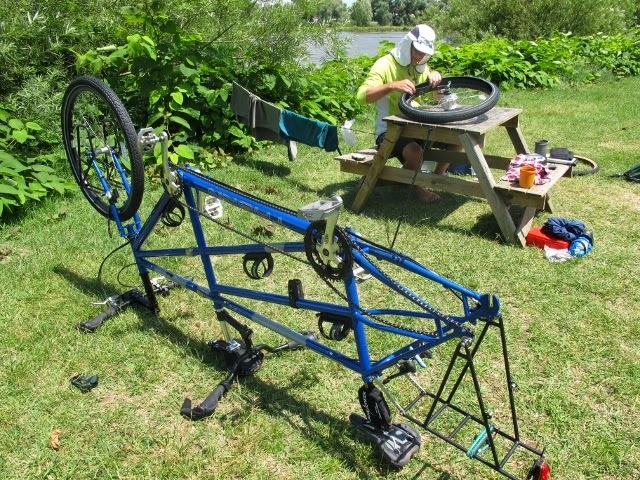 One said that friends with a tandem found that "out of sync" seemed to even out the pedal power and provide a smoothing effect when riding uphill. We investigated on the internet but were unable to find any serious research. 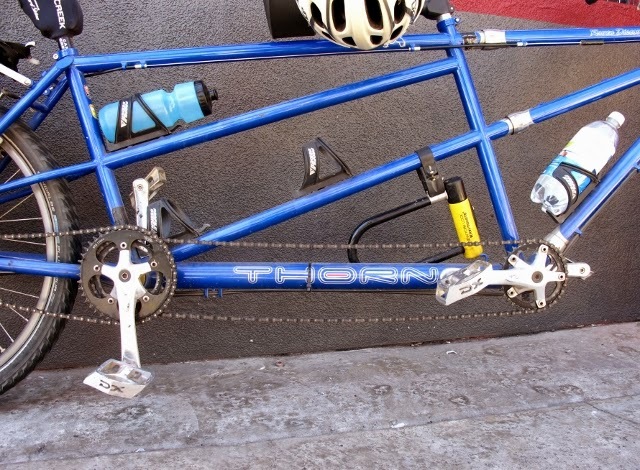 One article suggested that pedals are usually in phase for aesthetics and simplicity, but that "out of phase" should reduce wear and tear on the drive train. With a few hills still left on our ride to the Mexican border we decided to give "out of phase" a trial and so far, so good. It’s early days, but we sense that on the flat and on gentle uphills we are pedalling at the same speed but doing it in a higher gear – which means covering the ground faster. On steeper uphills, we seem to be dropping down through the gears just the way we always have, but even then we suspect the pedaling is just a little easier. Perhaps we should have tried this a year ago. 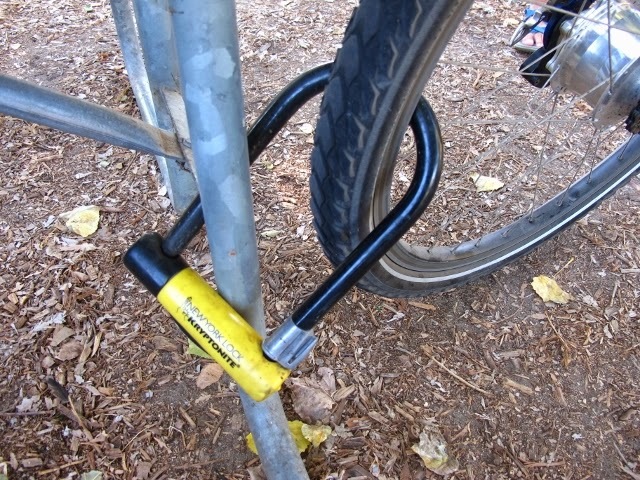 Santa Barbara: The back seat rider on a tandem bicycle was guillotined by a car park exit barrier Saturday. It struck the woman’s glasses forcing them down onto the bridge of her nose and then hit her arm. She was not seriously hurt. Guillotine Victim: New Zealander Judy Yeoman (left) just minutes before she was struck by a barrier arm at a car park exit. She's seen lunching with new friends Pat, Lucas and Stan Brown in Downtown Santa Barbara. Her husband, Mike Brockie, said he was following a car out of the car park and knew there was a barrier arm. The pair were trapped by the barrier, unable to go forward or back as it lay between them. They had to dismount and push the bike out from underneath it. She said she was fortunate they stopped when they did, otherwise she would have been stuck a severe blow on her helmet. The couple had been lunching with friends at a nearby café shortly before the incident. To reach the car park, they had pushed the tandem through a walkway but decided to leave via the main exit. Until it becomes impossible to sleep on. 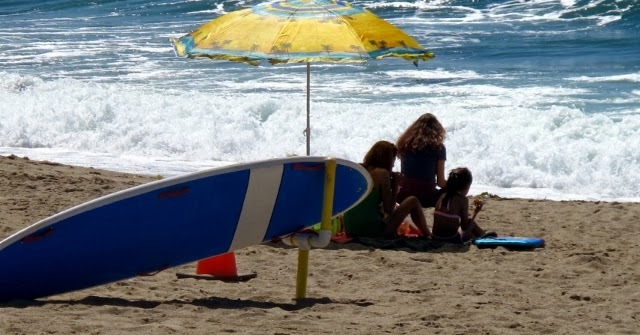 Suddenly, in a day’s ride, we have made what feels like the transition into the California of our imaginations – palm trees, blue seas, surfboards, tanned bodies and a soundtrack playing in our heads that dates back to The Mamas and The Papas and The Beach Boys. Walnut trees in the Santa Rosa Valley, near Buellton. Today (13 Sept) we rode south from a town called Lompoc, it’s the nearest place of any consequence to the giant Vandenberg Air Force Base. We took the advice of a fellow cyclist and instead of following the regular cyclists’ route we took Santa Rosa Rd, which runs for 17 miles through a stunningly quiet and beautiful valley of grape vines, wineries and walnut trees. On either side of us steep hills climbed into the blue sky. The land looked dry, the road meandered gently and we pedalled happily – thinking how much this region reminded us of Central Otago. We stopped at Buellton and instead of the usual filled rolls from a supermarket we dined at Ellens Danish Pancakes where we stuffed ourselves with pancakes and coffee that kept on coming. Back on the road, the traffic was much heavier and faster as we rejoined Highway 101 and climbed over the hills and then raced down to the coast. And there were those palm trees and a sunlit beach. 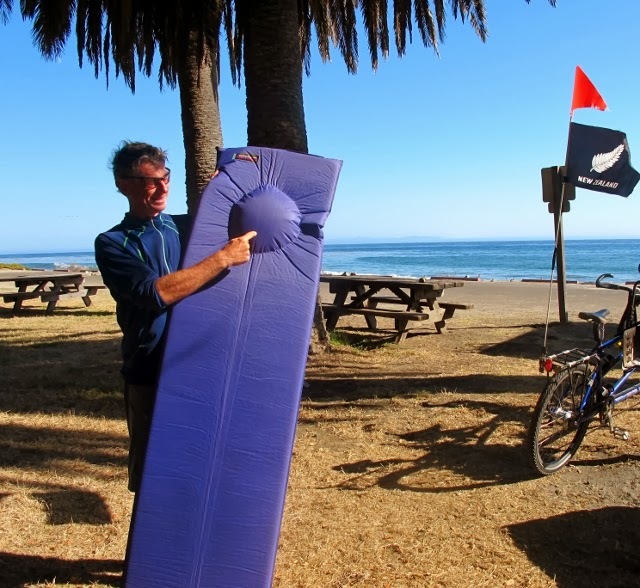 The coastal fog had vanished out to sea and people were enjoying the water in kayaks and on SUPs (stand up paddle boards). 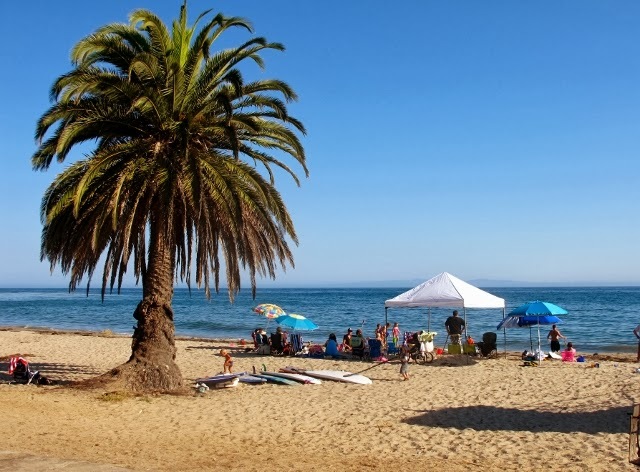 Tonight our campground is Refugio State Beach, about 20 miles north of Santa Barbara and within 120 miles of Los Angeles. We are camped on the foreshore, there are hot showers and a store where we bought a bottle of wine and two beers. The sun is drifting towards the horizon and to add visual interest we can see three oil rigs out at sea. We know we will fall asleep lulled by the sound of breaking waves. It’s taken 102 days to get here from Vancouver BC – that must be some sort of record for the Slowest Tour Down the Pacific Coast Highway – but it feels like we are in California at last. plenty of other wildlife to keep us awake. The mouse was tiny and kind of cute. It was hard to think of it as vermin – spreading nasty bugs. Judy was the first to become aware of him (let’s call him a him, but he could just as easily have been a she) as he noisily trampled his way over the floor of the outer tent – the area tent makers like to call the vestibule. I got a nudge and Judy whispered in my ear, “there’s something out there” with her usual sense of the dramatic. 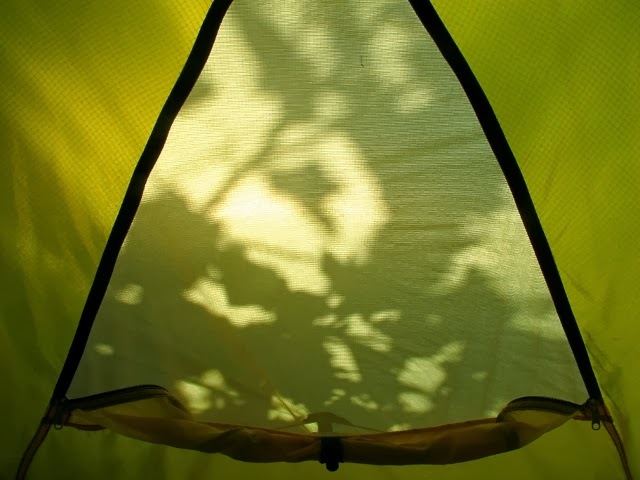 We unzipped the door to the inner tent – our bedroom – and shone a headlamp into the vestibule. Its beam picked up nothing and then suddenly - the tiniest of mice. He was gray and so skinny his ribcage was clearly visible through the taut skin of his chest. 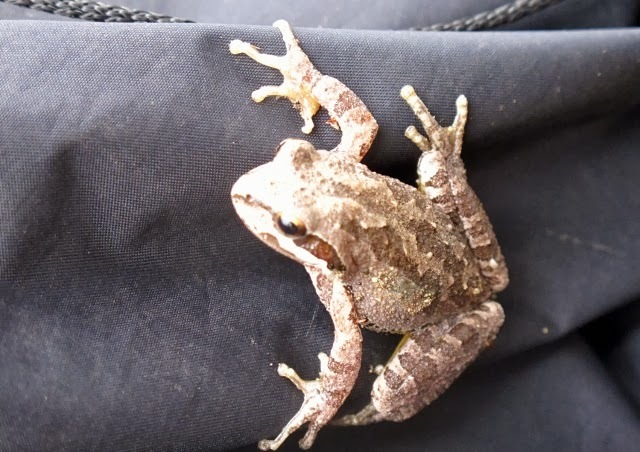 I tossed a jandal at him, but before the jandal had left my hand he was gone – out under the fly and into the darkness. 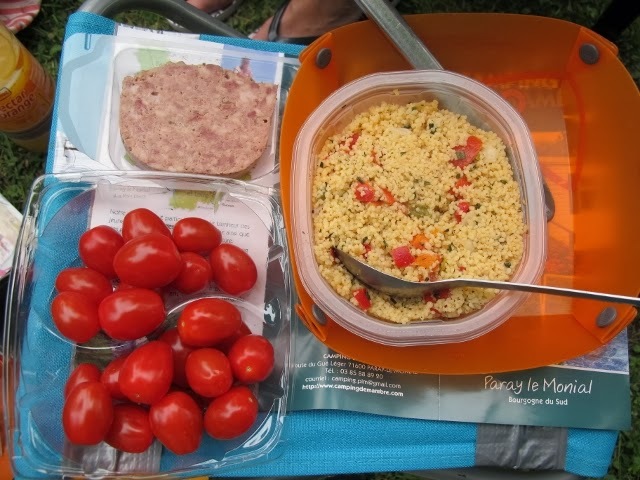 We had a quick discussion and decided that our food was securely stowed in our black, roll top bag. A racoon would have no difficulty getting in, but a mouse would never make it. Five minutes later he was back, clopping around on the floor and rustling over a plastic bag as though he was wearing two pairs of those cycle shoes with metal cleats on the bottom. 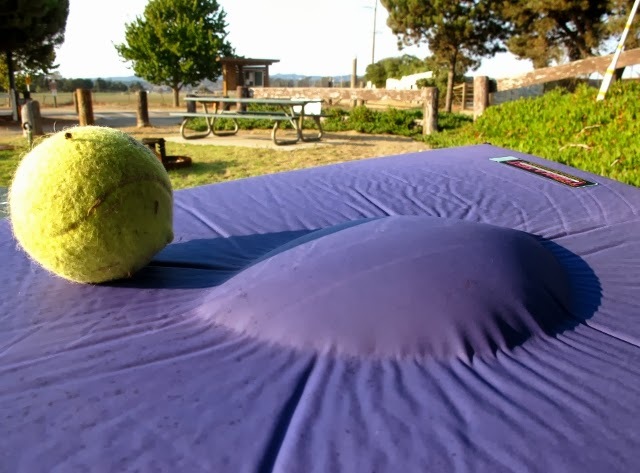 We shook the tent, muttered and the noise stopped – for a few minutes. It carried on like that for much of the night. The result of gopher tunneling near our tent. Part way through the darkness came another sound – hard to describe but a gnawing, shovelling sort of sound as though something was burrowing into the floor of our bedroom. The sound seemed to be coming from near our feet, so I kicked the floor and hoped whatever was there would go away. We woke feeling a bit jaded but grateful we were having yet another day off on the Slowest Bike Tour Down the Pacific Coast Highway. 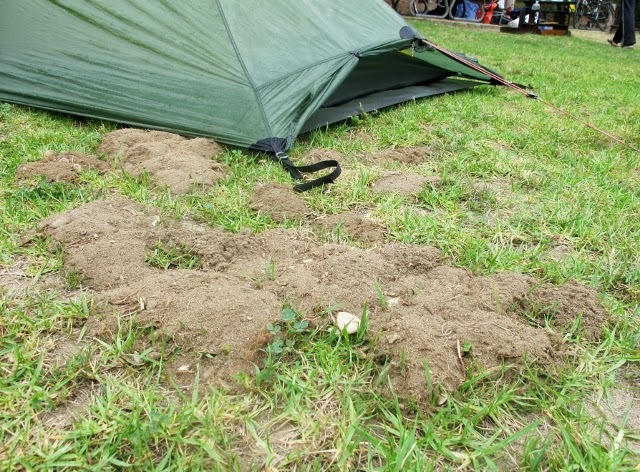 Outside the tent, mounds of earth had popped up, and peering under the tent it was obvious some little beastie had shovelled his way out there too. As we ate breakfast, there was a slight movement and suddenly a head emerged from one of the mounds. 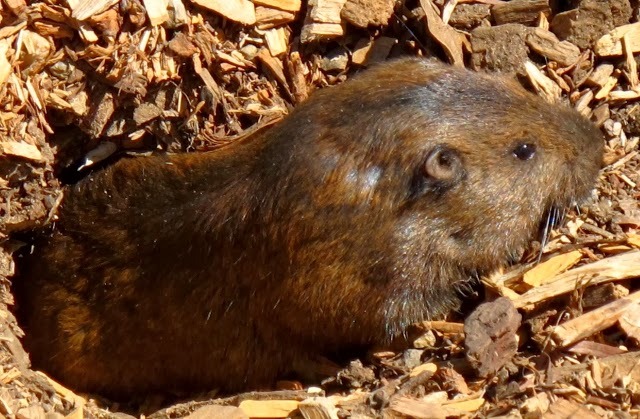 The gopher looked around unblinking despite the bright light, then retreated down his hole. We discussed what to do. Should we move the tent so we were further away from our gopher? Could it gnaw its way through the tent floor? How sharp were their teeth? If it got into the tent, would it tear around like a mad thing trying to escape – like the baby possum a friend had as a youngster. A fellow camper suggested pouring water down the gopher’s holes – or should that be gophers’ plural? We didn’t know if it was one or a whole family making those little dirt mountains. In the end we decided to do nothing. We found this frog plastered on the side of our wine bottle. That evening we were having dinner in the vestibule when suddenly I felt a movement on my leg. I glanced down and there, nestling into the hairs on my calf, was that tiny mouse – he was so warm I could feel the heat from his body. He must have sensed he had been spotted and a moment later he was gone – behind the black bag and under the tent fly again. Judy reached for the wine bottle – anything to get us through the night – and almost dropped it with fright. There was a frog stuck to the side of it. We prodded it with our fingers and eventually it followed the mouse and hopped out under the tent fly. Judy and I made an agreement. 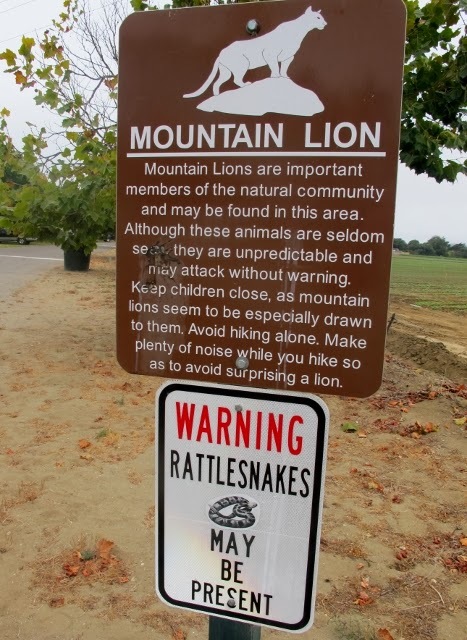 We would not be intimidated by a mouse, a frog or a gopher. Do what they may, we were determined to get a good night’s sleep and we wouldn’t respond no matter what happened. And that’s the way it was. The mouse trampled in his bike cleats, the gopher shovelled earth to its heart’s content and in the morning we found the frog under the tent. It was 3-0 to the wildlife.